Cancers that arise in the lung are mostly of the type known as NSCLC (non-small cell lung carcinoma). A much smaller proportion of lung tumors arise from neuroendocrine cells in the lungs. These cells (which are also found in most other organs) secrete a variety of hormones that are necessary for normal organ function, as well as for healing after injury or infection. Like other lung cells, neuroendocrine cells may transform to become cancers. Lung cancers that arise from neuroendocrine cells are called pulmonary neuroendocrine tumors (NETs), or lung NETs. Pulmonary NETs comprise about 25% of all NETs. Within this group are three major types: carcinoids, large cell neuroendocrine carcinoma of the lung, and small cell lung carcinoma (SCLC). Because lung NETs (with the exception of SCLC) are relatively rare, development of treatments can be difficult. Here, I discuss treatment options for each type. 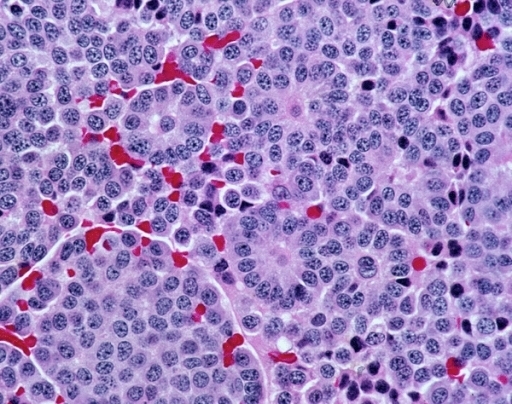 Carcinoids are divided into two subtypes, aptly named typical and atypical. Typical carcinoids grow very slowly and rarely need treatment; atypical carcinoids grow faster, but not nearly as fast as other major types of lung cancer. Carcinoids sometimes produce excess amounts of the hormone serotonin, which leads to carcinoid syndrome—diarrhea, flushing, and wheezing—although this happens more often in gastrointestinal carcinoids. Carcinoid syndrome is treated with drugs known as somatostatin homologues (eg, octreotide), that inhibit production of serotonin. Surgery is the primary method of treating typical carcinoids. A procedure called video-assisted thoracic surgery (VATS) is performed whenever possible, because it does not involve cutting through the ribcage. Due to the rare nature of advanced carcinoids, there are few clinical trials for people with these cancers. Drugs currently being tested include radioactive octreotide, which could not only reduce levels of serotonin, but also kill NET cells. Targeted drugs like pazopanib and regorafenib are also being tested, even though it is not clear that the proteins targeted by these drugs are involved in malignant progression of carcinoids. However, they may inhibit growth of blood vessels feeding the tumors. Chemotherapy (with the same drugs as those used for SCLC—see below) is still a mainstay treatment for advanced carcinoids. SCLC is a very aggressive type of NET, and these tumors comprise about 13% of all lung cancer. A vast majority of SCLC tumors develop in smokers. Most SCLC patients are diagnosed at a late stage, with extensive disease. SCLC is treated with aggressive chemotherapy—usually platinum drugs in combination with etoposide. Initial responses are frequent, but relapses are almost inevitable. There is no standard of care for the treatment of relapsed (recurrent) SCLC. However, sunitinib, a drug that targets blood supply to tumors, was recently shown to have modest efficacy in prolonging progression-free survival (PFS) of people with SCLC. Radiation therapy, usually reserved for treatment of brain metastases, was also found to prolong survival of patients with extensive-stage SCLC who had previously received chest irradiation after chemotherapy. Recently, some progress has been made in the development of new drugs for SCLC, as we have already reported. Treatment with pembrolizumab, an anti-PD-1 immune checkpoint antibody, induced responses in 35% of SCLC patients in a clinical trial. In a different trial, the combination of nivolumab with ipilimumab produced responses in 36% of heavily pretreated patients. Testing of so-called immune checkpoint drugs in combination with chemotherapy, other drugs, or radiation is ongoing for SCLC (see these trials: NCT02402920, NCT02331251, NCT02359019, NCT01928394, NCT02472977, NCT02481830). New types of chemotherapy drugs for SCLC have also been associated with improved responses. In one clinical trial, PM1183 (lurbinectedin) given with the chemotherapy drug doxorubicin prolonged PFS after SCLC relapse. IMMU-132 has also shown promising activity in SCLC. There are currently several targeted drugs undergoing clinical testing in SCLC. Among these are inhibitors of proteins that drive cell division in SCLC: alisertib (NCT02038647), roniciclib (NCT02161419), and G1T28 (NCT02499770). Other drugs in trials include inhibitors of various cellular pathways that are involved in the development and progression of SCLC: LDE225 (NCT01579929), an inhibitor of the ‘hedgehog’ cellular pathway; selinexor (NCT02351505), a drug that inhibits movement of proteins within the cell; VX-970 (NCT02487095), an ATR kinase inhibitor; and more. Large cell neuroendocrine cancer is an aggressive type of cancer encountered four times as frequently in men as in women. Nonetheless, it is quite rare in general. There is no established standard-of-care treatment for large cell neuroendocrine cancer, and it is treated in pretty much the same way as SCLC. As with other types of NET, the rarity of this cancer makes drug development difficult.